Shelties are “people” dogs who want to be with their owners at all times, with varying energy levels and exercise needs. The Shetland Sheepdog, or “Sheltie” originated in the Shetland Islands where they were small general farm dogs, helping to herd the small Shetland livestock as well as being watchdogs. They were known as Peeries or Fairy Dogs. 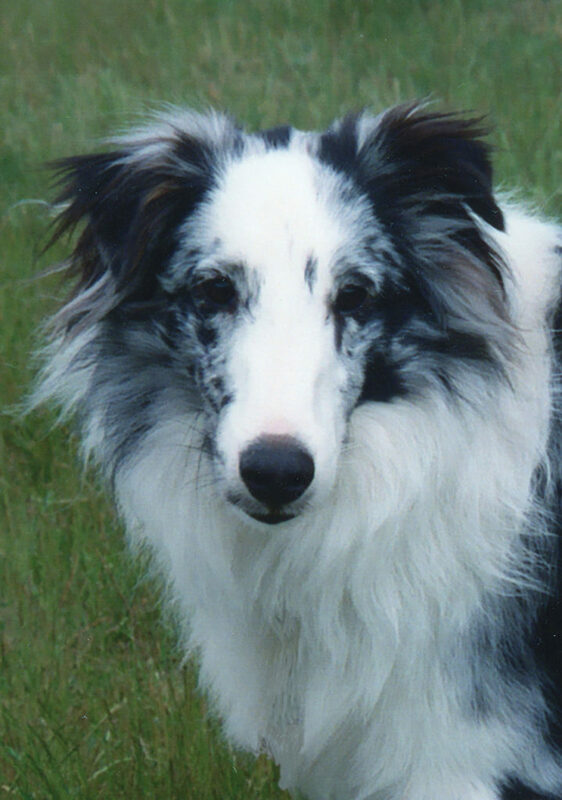 They gained popularity in the late 1800s and were crossed with spaniels and pomeranians, to make a fluffier coat, as well as with the collies loosely called border collies that were ancestors of both Shelties and Rough Collies. Shelties are not a miniature Collie. They were recognized by the AKC in the 1930s and are a relatively recent breed. Originally bred to herd livestock, some Shelties still retain this instinct. They are active dogs that are very attentive to their owner’s commands. They are very competitive in agility, obedience, and other performance events. As with many herding breeds, they tend to be wary of people they don’t know. Adults and older children who want a dog to be their companion. 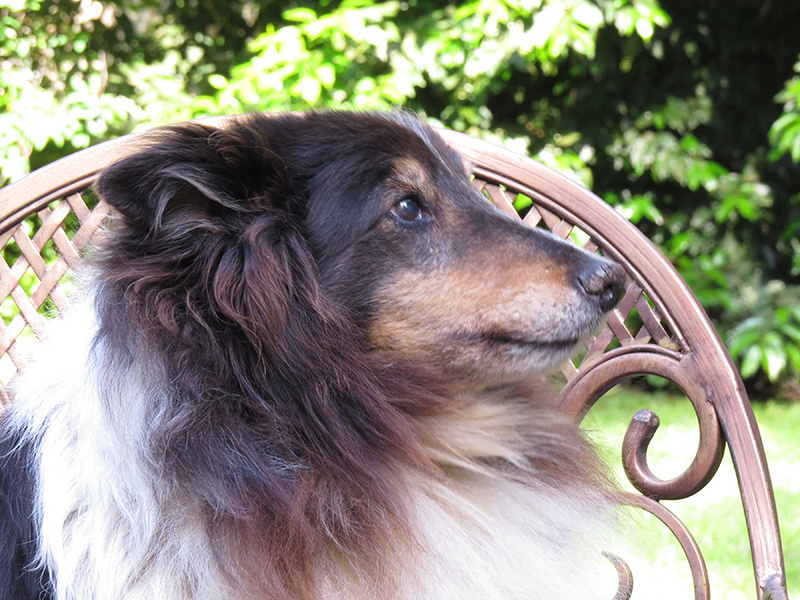 Shelties need to be with their people as much as possible and do not do well left in the backyard. They need to be in the house and close to their owners. Someone who wants an outside-only dog. Someone who works all day and cannot spend several hours a day with the dog. Shelties are very smart and affectionate. They are extremely loyal and well-mannered. They tend to be clean. Not recommended for apartments or condos. Some have a high exercise requirement. Some can be very shy with visitors and people they don’t know. The long coat needs regular brushing. 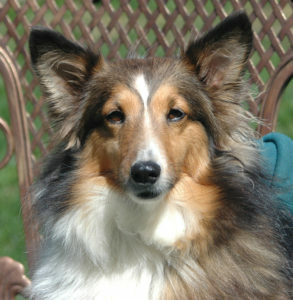 Shelties can range in size from 12 to 20 inches at the shoulder and weigh 12 to 50 pounds. To be eligible for AKC conformation competition the dog must be between 13 and 16 inches at the shoulder. Any size Sheltie can compete in performance events. 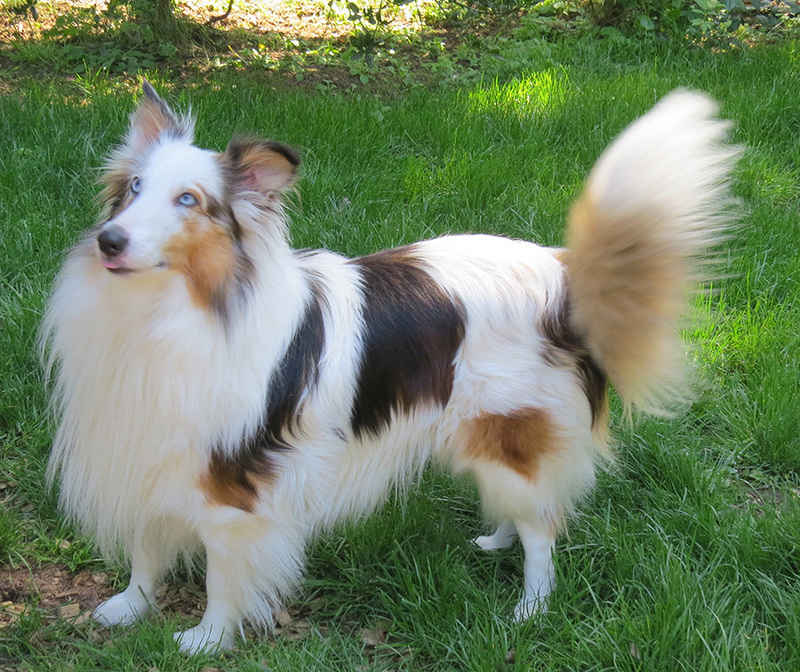 Shelties come in three basic colors: sable, black, and blue merle. Sables can range from a light golden brown (the “Lassie” color) to a dark mahogany with white points. Blacks with white and tan markings are called tricolors. Blacks with white only (no tan) are called bi-blacks. Blue merles are gray with black marbling or spotting in the coat with white and tan markings. If they have no tan they are called bi-blues. Sables may also have the merle gene and be sable merles, light brown with darker mottling in the coat. Shelties may have a head with any of these colors and a predominately white body, in which case they are called pintos or color-headed whites. An all-white Sheltie is a double merle and often cannot see or hear. These are not to be confused with the whites that have normally colored heads. The only color to disqualify a dog from conformation is brindle, although dogs with more than 50% white are heavily penalized. Any color may be shown in performance events with no penalties. Varies widely. Some have tons of energy and excel at agility. Some have herding instinct and want to chase everything that moves. Some are couch potatoes. Most lie in between these extremes. Most do require off-leash exercise that allows them to run and therefore require a fenced yard. Average is about 14 years. Shelties can be good with children if they are raised with them. Otherwise they may not like small children. They may herd and nip at them. They can be intolerant of mistreatment by small children. For this reason most rescue Shelties cannot be placed in homes with young children. If you have children under 6 years of age and have your heart set on a Sheltie consider buying a puppy from a reputable breeder. Shelties can usually get along with other pets. Dogs with high herding instinct can be pests if you have livestock. Barking!! Definitely a barky breed. That aside, Shelties are great at agility, obedience, and flyball. They love to please and are fast learners. Shelties have a double coat that requires weekly brushing. They should be trimmed around their ears andpaws. They do not require frequent bathing. Never shave your Sheltie – sometimes the coat may not grow back, and even if it does the quality of the coat is changed. The hair dropped in shedding is easy to vacuum up and does not work itself into fibers or carpets. Brushing keeps most of the hair in the brush and off of the floor. The most prevalent problem in the breed is hypothyroidism, with about 25% of all dogs affected. It is easily and cheaply treated with a supplement. Eye problems, hip dysplasia, bleeding disorders, epilepsy, and autoimmune issues can be present. Dermatomyositis is a serious, inherited autoimmune disease that causes scarring on the face and degeneration of the muscles on the head especially, eventually making it impossible for the dog to chew or drink.